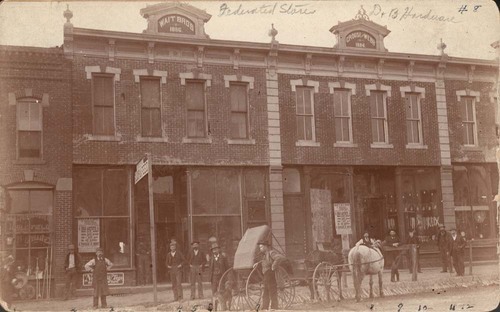 This is a view of businesses in Sedan, Kansas shows the Heimbaugh Hardware and Clothing. This is now the Sedan Seed House. The Wait Brothers building is now occupied by Stocks Department Store. The Crouse and Webb building is now occupied by Hughes and Hendrix Drilling Company. The Western Auto Store is now located on the far right side.